Let us introduce you to Su-Lin, our latest 3 1/2" Panda bear. 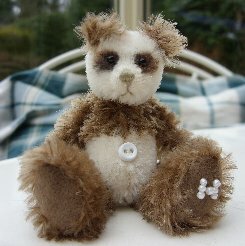 He is an adorable little bear made of short, silky, tufted mid-brown German mohair combined with very short, velvety soft white Schulte mohair. His pads and paws are brown cashmere, he has a light brown stitched nose and painted panda markings. We have filled Su-Lin with steel shot for weight, so he is nice and heavy for his size. He has a white belly button and shiny black German glass eyes. Our panda bears are usually very popular and we have not had one for a while, so if he is the boy for you, let us know soon. Su-Lin costs £39 plus postage. Please note that as with all our bears, Su-Lin is not a toy and is not suitable for children. Sorry - Su-Lin has been adopted.